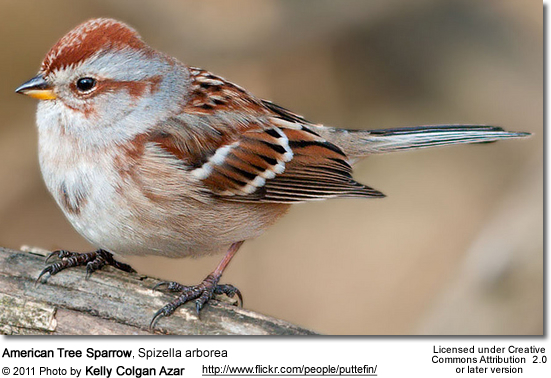 The American Tree Sparrows (Spizella arborea) are medium-sized birds that breed throughout most areas of Alaska, the Yukon and Northwest territories, the very north of Manitoba and Ontario, all of Labrador, and in northern Quebec. For the winter season, these sparrows migrate south to southern Canada and United States down to northern Texas. They typically winter in open forests, gardens, fields and marshes. 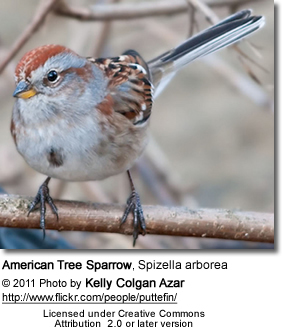 American Tree Sparrows average 5.25 inches in length (including its slim, forked tail). Adults have a rusty crown and grey underparts with a small black spot on the breast. They have a rusty back with lighter stripes and brown wings with white bars. Their face is grey with a rusty line through the eye. Their flanks are lightly brown tinted. The bill is dark-colored with a yellow lower beak. It has a grey supercilium and face. Males and females look alike. The plumage of immature birds is duller with streaked chest. It looks like the Chipping Sparrow, but the Chipping Sparrow has a white supercilium and black eye line. 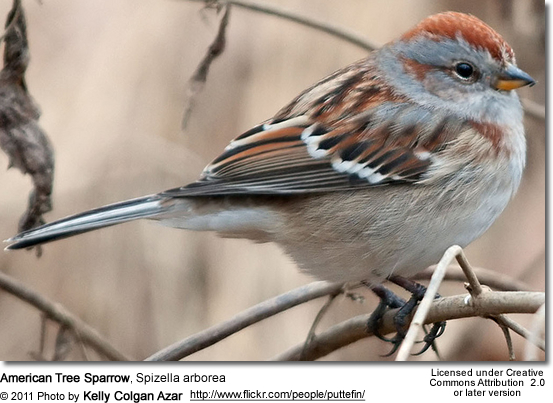 The Field Sparrow can be identified by its pink beak and white eye rings. 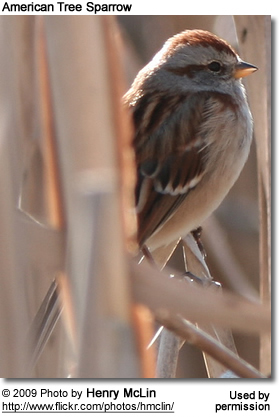 The Swamp Sparrow has rusty wings and a dingy breast. 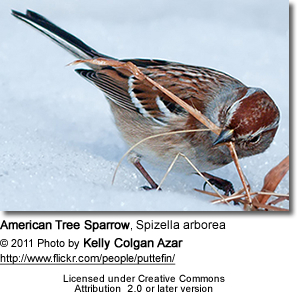 American Tree Sparrows breed in open tundra with scattered shrubs, often near lakes or bogs situated at the northern limits of the boreal forest in Alaska and northern Canada. The female alone builds the nest, which typically consists of a clump of grass situated near the base of a tree - but could be placed up to a few feet above the ground in a tree. The average clutch size consists of 4 to 6 eggs (most often 5) which are incubated by the female for 12 to 13 days. Both parents feed the nestlings, which fledge in eight to ten days. American Tree Sparrows mostly eat weed seeds and insects. They will visit bird feeders during migration. They have large crops (neck pouches) in which they can store up to 1,000 seeds. They usually forage on the ground or in low bushes and outside the breeding season often in flocks; or they may scratch for millet underneath feeders. They are frequent visitors of bird feeders, together with Dark-eyed Juncos. The male's song can be heard persistently throughout the summer for the purpose of proclaiming territory. It sounds like a high warble descending in pitch and becoming buzzy near the finish.